This installment of 3DPBMCSHMtm deals with the dungeons of the three worlds. There are places where travel between is possible. These are often well-guarded. For other dungeons, getting out is harder. Altorr's dungeons are mostly isolated affairs. The notable exceptions are dwarven holdfasts and the Great Riddle where connecting tunnels run far away. Dungeons in Altorr have purpose. Abandoned mines, barrows for warlords, death-traps for tyrants, druidic labyrinths or dungeons to trap demon or faerie. These are just examples. These are typically spear-shaped. A tunnel with the warlord's deeds and fallen allies leads to a diamond-shaped chamber. Here the warlord and his grave goods rest. If disturbed, a warlord rises as undead and seeks vengeance until destruction or goods are returned. Natural caverns and grottos are adapted by some druids. Some are formed into labyrinths by earth magic while others are naturally enigmatic and maze-like. Apart from shelter, caves are home to numerous natural allies (bats, cave bears etc.) as well as safe storage. Death-trap dungeons and jails of night. Some dungeons are built to permanently solve political problems, combining oubliette with death-trap. Others are jails for demons and their cultists. Still others are built to hold faeries or those who have angered the Court of Shade. Those last two share less commonality than expected. Guardians are typically monstrous with traps designed to kill intruders or the prisoners of the owners. These labyrinthine caverns run the length of the forested hills and hold a gigantic bioluminescent fungus. They are located on Clune's southern border. Used by demon and druid, the Great Riddle is dueling ground, initiatory labyrinth and exceedingly strange. The Goblin Market regularly appears at entrances. Those visiting the Great Riddle rarely come out unchanged. The deepest caves of the Great Riddle are whispered to link to The Crawler's bloody wake. Bellotra is built upon ruins and decay. Places not already sacked, burnt-out or colonised tend to a quiet place. The Rotten Burgs have rat-runs of cellars and vaults. The canals also have sections underground. These Undercanals combine canal and sewer with volcanic mud, magma flow, desperate refugee and hungry monster. Most dungeonesque structures in Bellotra have a legacy. Mausoleums of ancient nobles and vaults for their treasures are well-known though often stories deceive. These are often decorated by art and sculpture. The extravagance of a permanent monument sits well with Bellotran taboos around death and oblivion. Oh yes, there will be magic. Spellsellers treat vaults as chances to showcase talents, building notoriety with ingenious traps or bizarre magics. Discretion can be a concern. Some spellsellers take an extended sojourn after a commission to prevent regrettable cases of mistaken identity. Others merely increase their fees. Elemental corrosion in Bellotra forces artisans to make lasting structures from elaborate materials and innovative methods. The artisans decorated the usual materials further. Ceramic tiles, tinted metal panels and glass bricks have been found in the vaults and mausoleums. Stone still provides the fundamental fabric. This is usually andesite or basalt (created by gate-induced vulcanism) or marble imported from the Elemental Plane of Earth. After a denunciation of fire as passé by certain nobles, use of para- and quasi-elemental matter in traps escalated. The resulting demand for special traps taxed imaginations. Early traps used super-cold, super-sharp ice. Later traps drowned thieves in mud, choked victims with smoke or incinerated them in flowing magma. The last required careful management. The tombs over Lemizah's Jewel in the Undercanals are slowly sinking into a pool of magma. Blinding ash clouds burn and choke unauthorised personnel. Brine pits dessicate air and toughen zombies within. Exploding geodes, jets of steam and prismatic rays kill. Lightning traps used deep underground do not invoke the aurora vortex on the surface. Exact depths are unknown though. Magical duststorms suffocate unlucky thieves and cause others to be lost, half-blind and coughing. When all you know is underground the world shifts. Carcetusian communities are close-knit, battling aberrations, oozes, slavers and giant vermin to survive. Light and water are life. Carcetus is a pragmatic honeycomb of constructed and natural tunnels, taking advantage of changes in geology. Dwarves take stonecraft further than most. Magic solves many engineering problems. Life in Carcetus rarely rises from war footing. 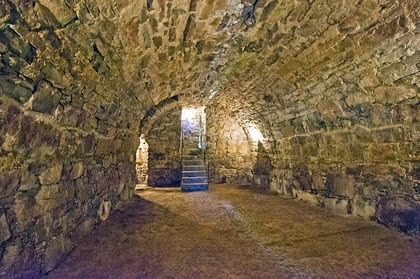 Tunnels are fortified by bolt-holes, casemates, choke points and redoubts. Traps are simple but effective. Entry and exit tunnels are defended to prevent incursion. Water supplies and food stores are strongly defended. The presence of aberrations shapes the tunnels of Carcetus. Aboleth construct dams and shallow lakes using slaves. Ettercap weave orbs of silk and sinew in three dimensions. Naga congregate around shrines and desolate tunnels. Otyughs lurk in cesspits and sinkholes. Some have been adopted by communities. Remembrance walls are etched with names of the fallen or bas-reliefs of faces scored into the rock. These are traced by mourners in the dark. Communities who revere Mordiggian or Saint-George construct simple crypts. Carcetusians get quite passionate about remembrance and history - both involve someone dying to reach this point. Common items between the three worlds. Travellers between worlds sometimes journey via dungeons. There are commonalities though none are that safe. Being among ghouls, travelling via gates or in the wake of a hungry god is... interesting. All worlds have crypts consecrated to the faiths of the Great Ghoul or the Pale Warrior. Ghouls of Mordiggian tunnel for books, lore and food. Their crypts hold surprises with lost magic and ancient secrets amid the chewed and cracked bones. The tombs of Saint-George inter dreadful secrets among the bodies of dead warriors. Both are perilous undertakings for adventurers. The dwarf Nidal knew refugees would come. During the Demonplague in Altorr, he sought demonic gates and fortresses yet found tunnels linking all three worlds. With allies in every world, he made great maps. These maps are priceless, whispered to hold powerful magic and the secrets to great wealth as well. His disappearance into the Tunnels has led to rumour of his being eaten by The Crawler. The god of pain and hunger is known to all three worlds. It's howling, bloodstained journey is heralded by purple worms. The resulting swathe of destruction is followed by earthquakes and beasts from all the three worlds. Chaos is left in it's wake. The Crawler's hide is studded with blades from hundreds who tried - and failed - to slay it.